After making your home and lawn look amazing, you want the hard work you’ve done to be seen at night – with the flick of a switch! 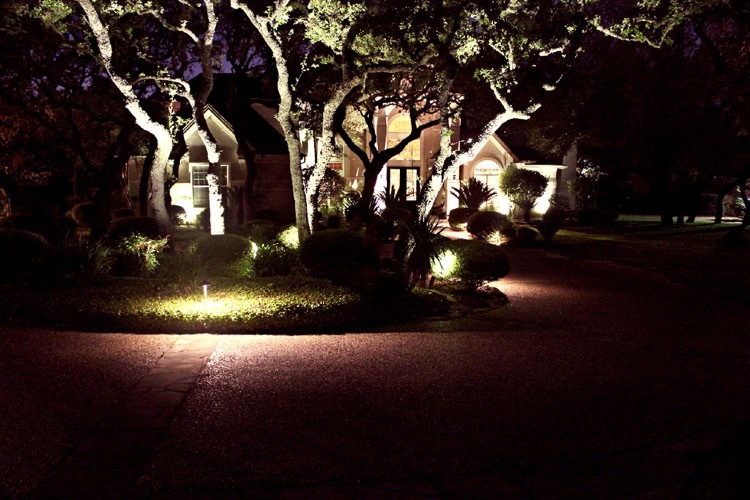 If you’re in the San Antonio area and looking for an outdoor lighting system for your landscaping, or to complement any new additions to your property, consider Luminary Lights. Our technicians in the San Antonio area can help you highlight your unique shrubs, flowers, or architectural accents. When you’d like highlights after twilight, especially architectural highlights, consider how your lighting gets set up. Night-lighting in your lawn requires expertise to ensure your indoors aren’t flooded with the outdoor lighting. If placed improperly, what should have been a nice, comfortable addition can create a headache and sleepless nights. Landscape lighting primarily uses little voltage making it easier to work with, and less costly to illuminate your beautiful lawn highlights and architectural uniqueness. However, that doesn’t mean it’s simple or easy to maneuver without a skilled specialist. Our skilled technicians excel in designing plans to accentuate your highlights. When dreaming of your perfectly lit outdoor space, it can be helpful to have few a ideas to share with your lighting specialist. Or, you can simply let the specialist guide you through the design process. Our specialists light the path towards a brighter future for your outdoor environment!